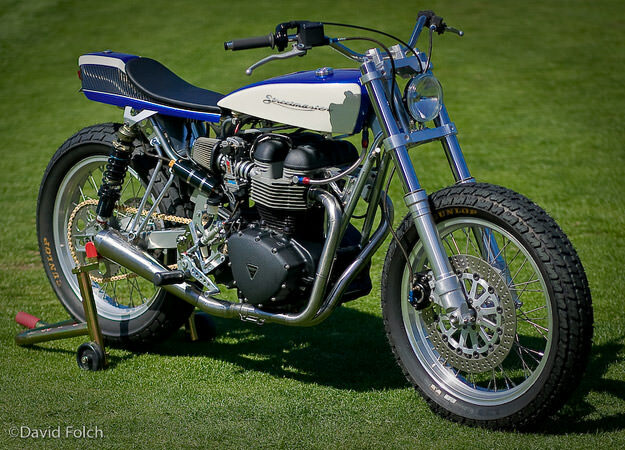 “The project is the brainchild of [Triumph fanatic] Richard Varner. 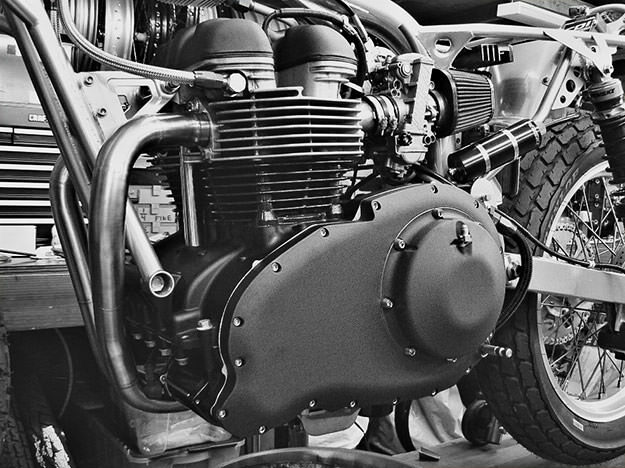 His vision was to build a Triumph street tracker using the current Bonneville motor in a lightweight chassis, while keeping a traditional Triumph street tracker look: High tech, but not too modern in appearance, with an increase of horsepower to over 70 at the wheel. And an all-up weight of 300 lbs (136 kg). The motor would be given a power boost by Triumph engine builder Charlie Barnes, and I would handle the chassis to house it in. “The end result was over 75 hp to the wheel, powering a package somewhere between 300-308lbs. The motor has retained the stock cylinder and pistons and runs on pump gas, despite a roughly 50% increase over the stock rear wheel hp! The motor weighs almost 200 lbs, so that didn’t leave a lot of wiggle room for achieving a 300 lb overall weight. I was staring at a window with a small opening: a rolling chassis with battery, lights, electrics, brakes and exhaust, and it had to come in at 100 lbs. So right up front, I knew it wouldn’t be easy or cheap. There would be titanium, carbon fiber and lots of trial and error involved before we could get the jump on gravity. “The end result? We have an extremely light chromoly frame with an aluminum tank and lightweight carbon seat shell. Components include Penske twin shocks, Speed Triple 45mm forks, a small battery from a 650 Suzuki, a billet oil cooler mounted below the fuel tank, Wood Racing stainless handlebars, KTM Brembo master cylinders and then the titanium. Lots of it: axles, the exhaust system, every nut and bolt, Ti brake rotors with a ceramic coating, lightweight brake lines, and Ti spokes fitted to tubeless wire wheels. Holes are drilled everywhere, with all components weighed prior to assembly. There was a continual search for a lighter solution. As amazing as it sounds, it could be lighter still. 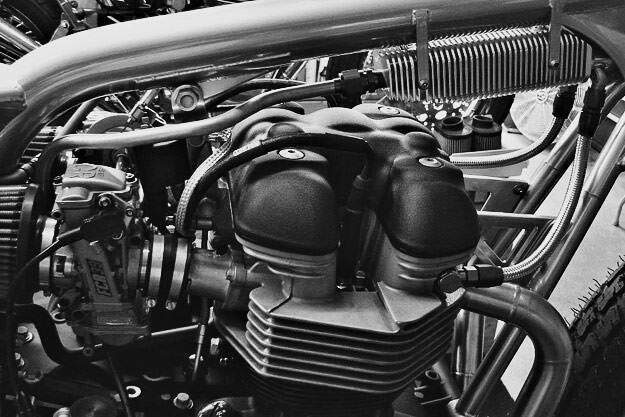 “The motor received extensive gas flow work, cams, a programmable ignition, valves, springs, and 39 mm FCR Keihin carbs—and lost 13 lbs (5.9 kg) from the crankshaft. 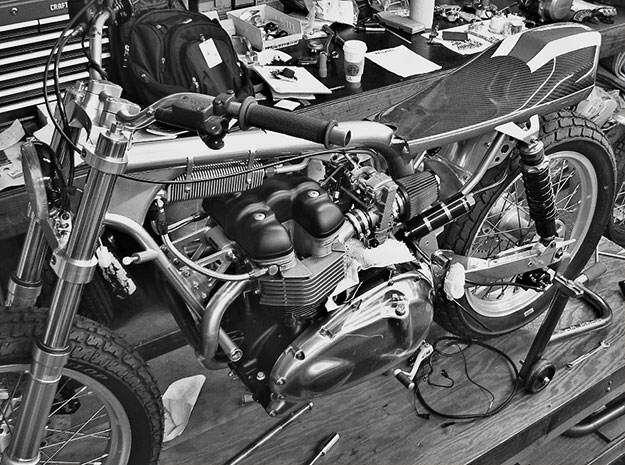 A huge amount of work went into the development of a billet primary cover using a KTM hydraulic clutch master cylinder. It improves accessibility for clutch servicing through a small removable side cover, and gives a weight saving of 2.75 lbs. Best of all, the looks of the bulky engine have been totally transformed into a motor that is pleasing to the competition-minded eye! “The long-term plan is to build a run of similar bikes, scaled back on the use of titanium for a more standardized ‘Production’ version. Weight will still be very light and when combined with a selection of motor parts being developed, this will be the bike Triumph should have built!” says Pollock.